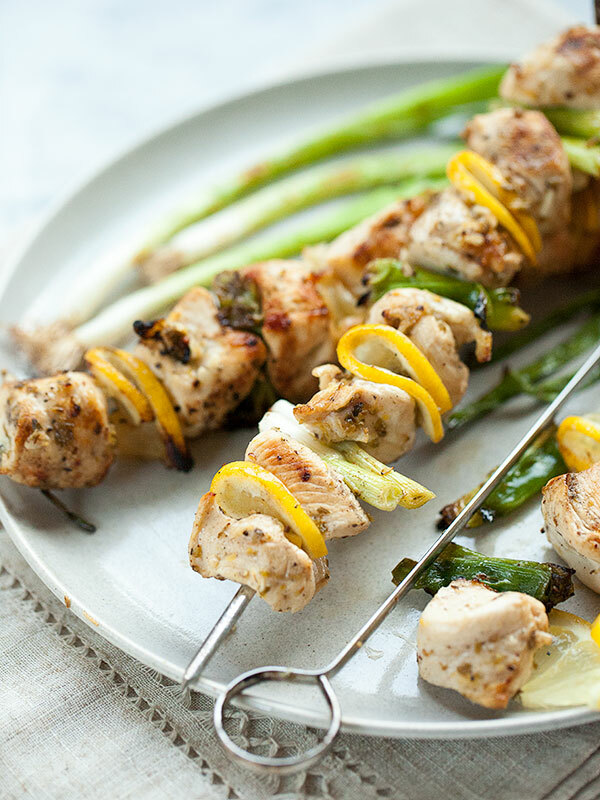 It’s always fun to fire up the grill and thread pieces of chicken, fish and veggies onto skewers. We’d go as far as saying it’s not summer without them! This curried potato and shrimp kebab recipe cooks in less than 5 minutes on the grill and packs plenty of flavours thanks to a generous amount of curry powder, garlic and cilantro. Method: Preheat grill to medium. Place potatoes in a microwave-safe container. Cover and microwave on High until just tender when pierced with a fork, 3 to 3½ minutes. Meanwhile, combine oil, cilantro, curry powder, garlic and salt in a large bowl. Reserve 2 tablespoons of the mixture in a small bowl. Add shrimp and the potatoes to the large bowl; toss to coat. Thread the shrimp and potatoes onto four 12-inch skewers. Grill the kebabs, turning once until the shrimp are pink and the potatoes are browned, 2 to 3 minutes per side. Stir yoghurt and lime juice into the small bowl of reserved sauce. Serve each kebab with 2 tablespoons sauce. 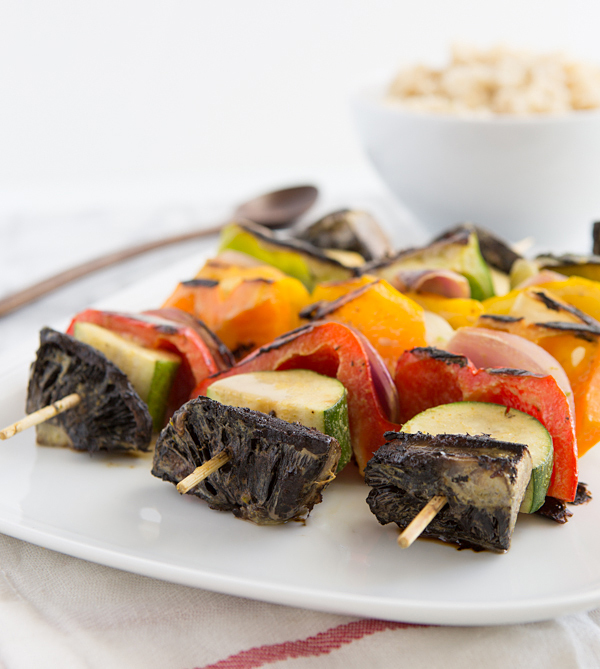 Herbed yoghurt does double duty as a marinade and dipping sauce for these colourful kebabs in this healthy dinner recipe. Serve with brown rice or quinoa and a green salad. Method: Combine yoghurt, lemon zest, lemon juice, oregano (and/or marjoram), garlic, 1 tablespoon oil, ½ teaspoon salt and ¼ teaspoon pepper in a medium bowl. Transfer ½ cup of the mixture to a small bowl and refrigerate until ready to use. Add chicken to the remaining yoghurt mixture and stir to coat. 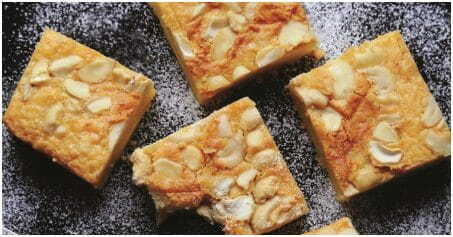 Let marinate at room temperature for 20 minutes or refrigerate up to 1 day. Preheat grill to high. Toss bell pepper and onion in a large bowl with the remaining 1 tablespoon oil and ¼ teaspoon each salt and pepper. 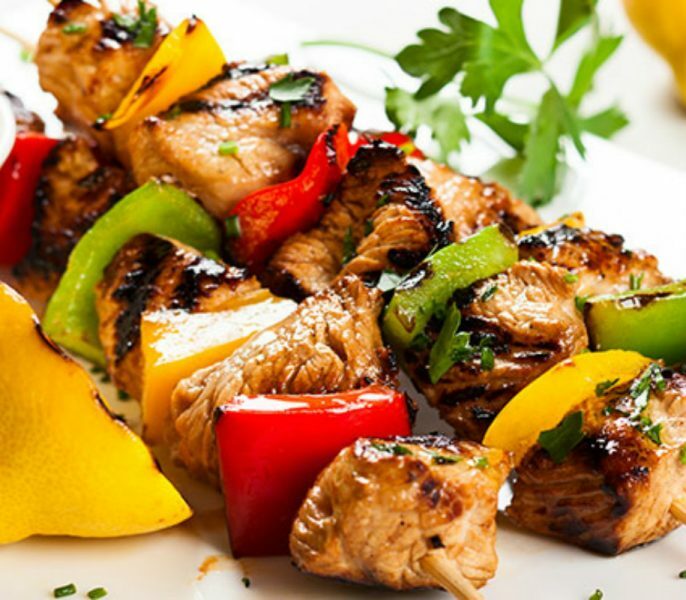 Thread the marinated chicken, bell pepper and onion pieces alternately onto eight 8- to 10-inch skewers. (Discard marinade.) Reduce grill heat to medium. Oil the grill rack (see Tip). Grill the skewers, turning once, until the chicken is cooked through and the vegetables are tender-crisp, 6 to 8 minutes per side. Serve with the reserved yoghurt sauce for dipping. Method: Cut the veggies into uniformly sized chunks and thread them onto skewers. 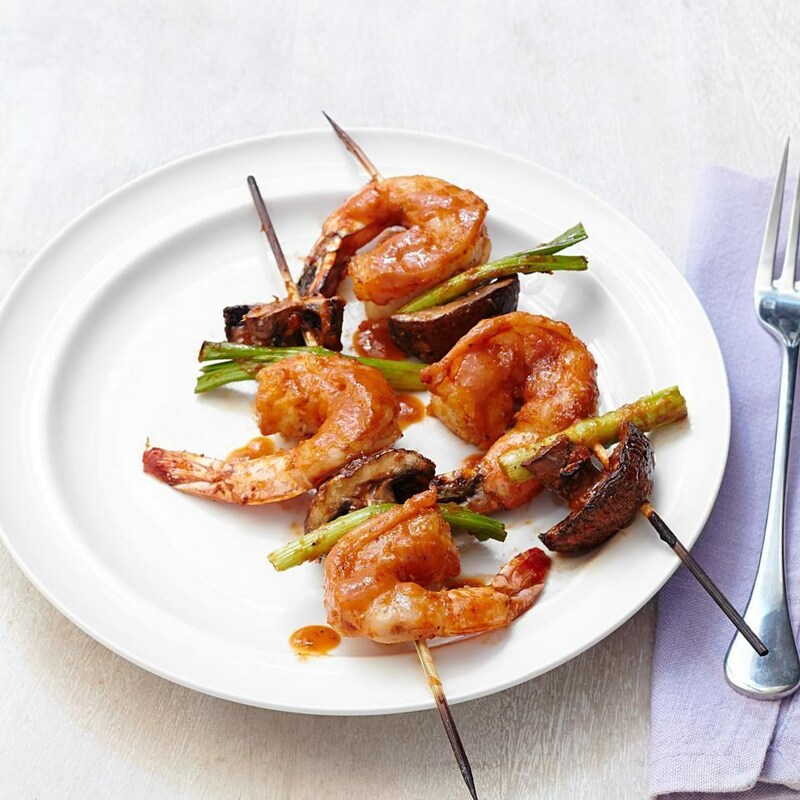 If you use wooden skewers, be sure to soak them in water for about 30 minutes first. Whisk together remaining ingredients in a large baking dish. Place kebabs in the dish, cover and transfer the dish to the refrigerator, and allow the kebabs to marinate for at least two hours, up to a day. Turn the kebabs every 30 minutes or so and brush them with the coconut curry marinade to make sure as much flavour soaks in as possible! If you’re using an indoor grill, heat it to high, spray the grates with oil or cooking spray, and cook the kebabs for about 10 minutes on each side, or until veggies are seared and tender, occasionally basting with extra marinade. For charcoal and gas grills, brush oil onto the grill rack and cook the kebabs until they’re done, turning and basting occasionally. It shouldn’t be more than 10 minutes, but grills vary so much in how they cook, it’s hard to be precise. Just keep an eye on the kebabs! 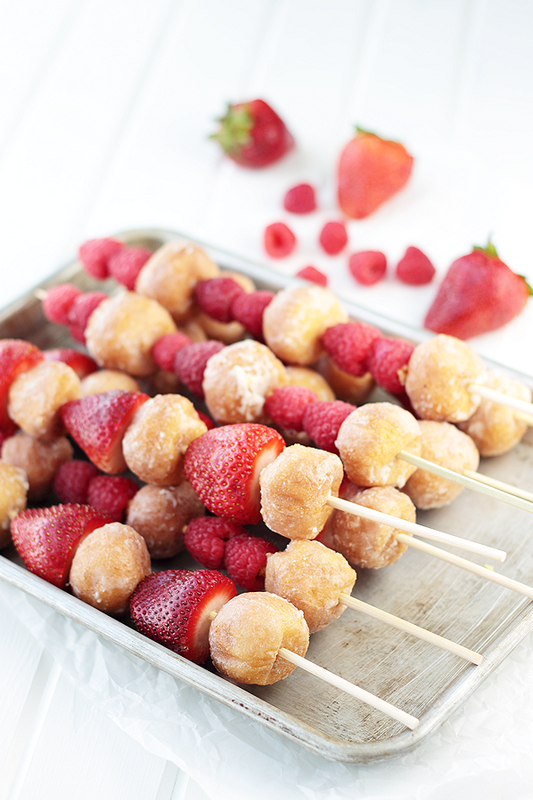 Instructions: Insert a wooden skewer into a doughnuts hole and then into a piece of fruit. Continue alternating with doughnut holes and fruit in the desired pattern. Drizzle with melted chocolate, if desired.